Hello, everyone! I’ve been so busy painting the living room and foyer that I haven’t got a tablescape ready for this week! I did make some time to look for some inspiration for the Easter table. Last year, it came easy to me…this year not so much. I just can’t seem to make up my mind! Do I want to go with a little rustic charm? Or maybe a table with a little touch of whimsy? I could always add a little height to the centerpiece using some tiered trays. What about this bright and fun table?!? It is so cute! I couldn’t find the original source but if this is your picture, please let me know and I will give you credit! Maybe I should just keep it simple! Have you got your Easter table ready yet! Thanks so much for stopping by! These are some great inspiration photos, Tammy! I haven't done my formal dining room table, yet. Like you, I'm confused about which way I want to go. I hope I figure it out soon. Easter will be here before we know it! These are all beautiful tables, Tammy! I think I like the first one the best. I have the green basket on the PB table, I think it might be too large for my table though, and where did they find the dinosauer eggs?!! I think it's about time I start fiddling with my dishes, too. Thanks for the inspiring pictures! Love these tablescapes, but the rustic is my favorite. I might try to duplicate that one! Thanks for getting me inspired and for visiting my blog and leaving a comment. First off LOVE all the Yellow sunflower pretty pictures at the top! I LOVE all the idea's for Easter table design! I don't have my table idea figured out yet but I think I'm going to have to pin the orange one so I don't forget! My kids would love that design and me too! Thanks for sharing and enjoy your Easter! Lovely inspiration for Easter tablescapes. I love all of them! Great inspiration ideas. It's hard to pick a favorite. Happy Easter! Lovely inspiration! 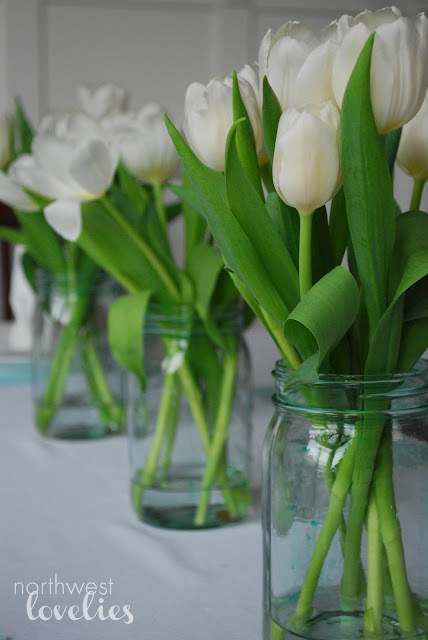 I keep wanting to try the flowers-in-an-eggshell idea -- it adds such a sweet touch! Tammy, there is lots of wonderful inspiration there...I especially love the orange, white and green table. Thanks, Phyllis! I thought it was Pottery Barn! Such wonderful inspiration! Thanks for some amazing tips. I vote that you do one of each!!!!!! :-) Uh oh, I'd better watch my back now! :-) These are all cute tables, Tammy, and I know you could knock any one of these inspirations out of the ballpark. I hope the painting is going well. Kudos to you for undertaking such a big project!!! I hope you have a chance to get a little rest this weekend to enjoy the first of Spring! Great inspirational photos Tammy, don't you love that aqua egg shaped dish in the first one? I couldn't possibly paint a room, much less two! Tablescaping will be a welcome relief and a joy after all that! With such awesome inspirations, I think I even want to do another table for next week..real Easter Sunday!! Thanks hon, I specially would love to make the white two tier cake stand, it's fabulous!! Thank you for sharing and for your sweet and kind comment. Enjoy your weekend. They are all beautiful! I'm pretty sure the cute orange tablescape with dog centerpiece is from pizzazzerie. Fun pics...I love the rustic charm!